Take steps to improve worker incomes, with the goal of reaching a living wage for all workers. You can view all company responses, here, as well as the Play Fair letter. 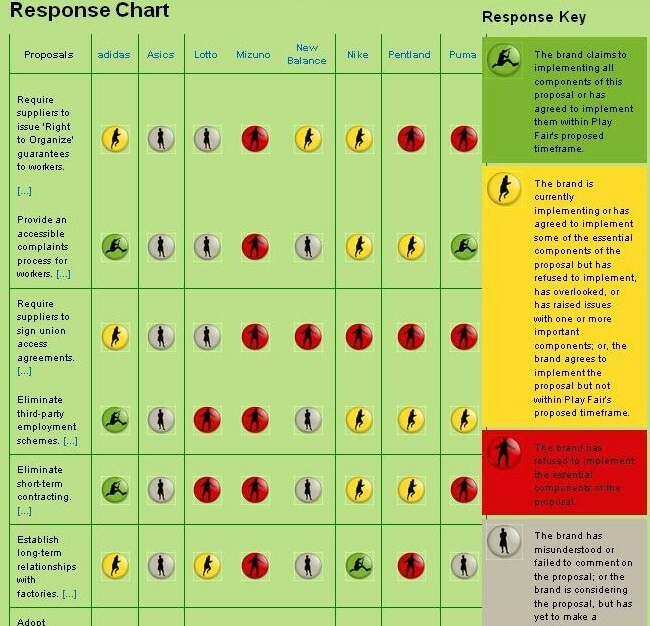 This image is a mere screen shot of the (very interactive) Response Chart and Response Key. Click on the image to be taken to the Chart of Responses. The Play Fair campaign is made up of the Clean Clothes Campaign (CCC), the International Trade Union Confederation (ITUC), and the International Textile, Garment and Leather Worker’s Federation (ITGLWF), in partnership with Maquila Solidarity Network, and other organizations worldwide. This entry was posted in Child Labour, Consumer Education, CSR, DESIGN, Education, Empowerment, Equal Rights, Fair Trade, Fast Fashion, Forced Labour, Freedom of Association, Gender Equality, Harassment or Abuse, Health and Safety, Hours of Work, Human Rights, Labour, Nondiscrimination, Overtime Compensation, Responsibility, Social Conditions, Social Responsibility, Supply Chain, Torture, Transparency, Wages and Benefits and tagged adidas, Asics, Clean Clothes Campaign, International Textile Garment and Leather Worker's Federation, International Trade Union Confederation, Lotto, Maquila Solidarity Network, Mizuno, New Balance, Nike, Olympics, Pentland, Play Fair, Puma, Vancouver on January 14, 2010 by Mary Hanlon.